Once the decision was made to establish a cemetery in Naranja, far away from Homestead but between Modello and Naranja, where fewer people lived, a new struggle broke out, similar to what had happened in Homestead. Interestingly enough, only one voice in opposition to the establishment of the cemetery has survived, that of Ernest M. Horton. No doubt, there were others, including George W. Moody in Naranja and Dr. John Dennis in Modello. But no documentary record of their opposition, if it occurred, is known to exist. On November 22, 1911, Frederick S. Morse wrote to J. R. Ingraham, Vice-President of the F.E.C., including the petition signed by Dr. Tower and 51 others (but not Horton), asking him to donate lot 14 “for cemetery purposes. It is understood that they will remove the body that has been interred … because of this body having been burried (sic) there. I want to get the cemetery away from Homestead on account of the water supply for the Extension coming from the reservation to the east of it and so I will suggest that you give this tract asked for in this petition.” On November 22, Ingraham granted Morse’s request and stated that the petition would be filed in the F.E.C.’s records. Horton would have nothing to do with any of this. He continued to fight the proposed cemetery and followed his objection of October 16 with a letter on January 22, 1912 in which he stated that the cemetery was “being occupied” and asked that the deed not be issued or, if issued, that it be revoked. At some point after Horton started protesting, a petition was drawn up asking for lot 13 but it is unclear if that petition was ever circulated as no names are on it. On March 18, Horton sent a telegram, threatening a lawsuit if the Model Land Company did not cease and desist. Morse’s response was to the effect that the Model Land Company was caught between Horton and the signers of the petition and that the two sides needed to resolve the conflict before the Model Land Company would proceed. 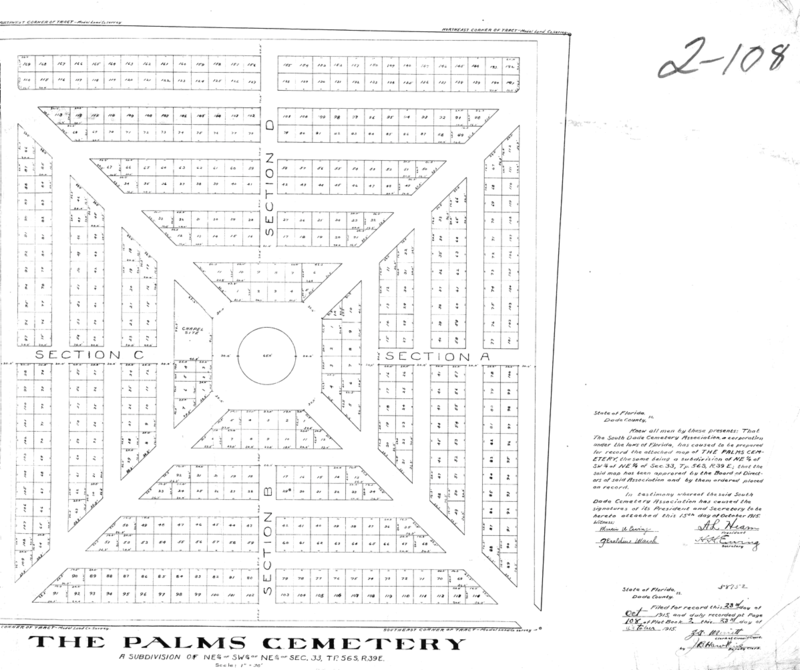 Horton’s protests were finally ended when the location of the cemetery was changed from lot 14 to lot 11 at the first meeting of the Silver Palm Cemetery Association on March 23, 1912. 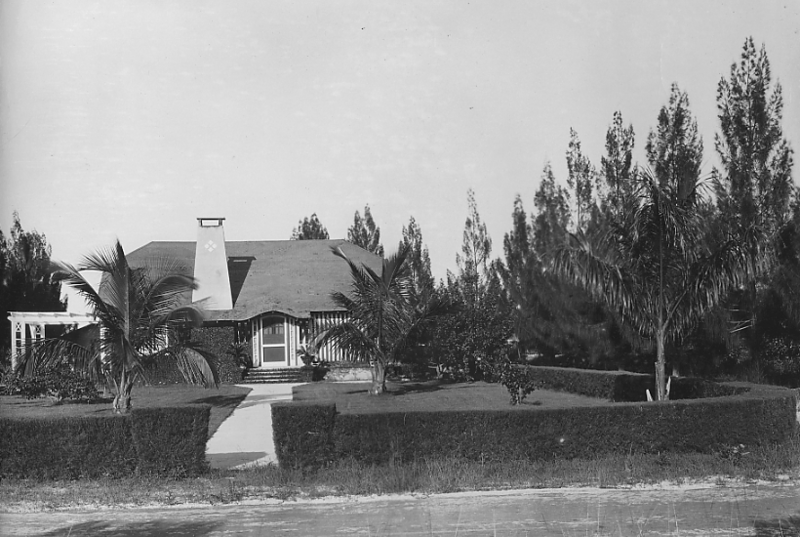 The disagreement between Horton and the signatories on the petition came at a cost, though, because while the Model Land Co. initially offered to donate the land, they tired of all the fighting over the location and decided instead to sell the property for $35 an acre. Horton’s motive for his actions became clear in a letter he wrote to Morse on March 27, 1912. In that letter, he wrote “Should deed be issued to 11, 14 and 13 will no doubt be open to purchase and I would beg to complete sale.” Just like Dr. Tower, Horton did not want a cemetery close to his property. The first documented burial in the new cemetery took place in late March, 1912, when the body of Mrs. H. G. Davis was buried there, near the “centre (sic) of lot 11”, according to a letter from Ernest Horton to Morse on May 2, 1912. A note was also published in the local newspaper, which had just been established by Rev. Joseph A. Kahl.1 This was almost certainly the wife of George H. Davis, who was the chief inspector of the F.E.C.’s Key West Extension. The name of the association was changed to the South Dade Cemetery Association at some point before November 26, 1915, when deed #3182 was issued by the Model Land Company. That deed is recorded in Deed book 127, page 152. The plat is in Plat book 2, page 107. 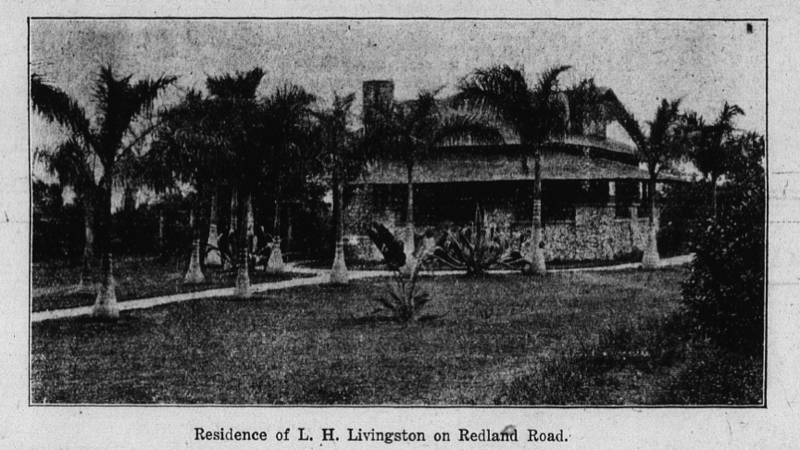 On October 17, 1914, the South Dade Cemetery Association convened, lots were sold to John E. Reynolds and Frank I. Wiggins for $10.00 each and Early L. Davis was paid $23.47 for his labor. Claude W. Hill was instructed to issue membership cards at $1.00 each, the funds raised going towards an improvement fund. On the motion of Marion L. Williams, former postmaster in Detroit, seconded by Thomas Brewer, the Association decided to establish an auxiliary board of women who would help raise funds for the improvement of the cemetery. The following women were appointed: Mrs. Thomas Brewer, Redland; Mrs. A. L. Chandler, Silver Palm; Mrs. M. L. Barcus, Princeton; Mrs. J. Nesbit, Goulds; Mrs. E. M. Horton, Naranja; Mrs. J. M. Holcomb, Homestead; Mrs. E. C. Loveland, Longview and Mrs. Florence Hunt, Florida City. These women and others would be the backbone of the group of women who organized the May Day festivals held at the Redland Guild Hall in subsequent years as a fund raiser for the South Dade Cemetery. But that is another story for another day. 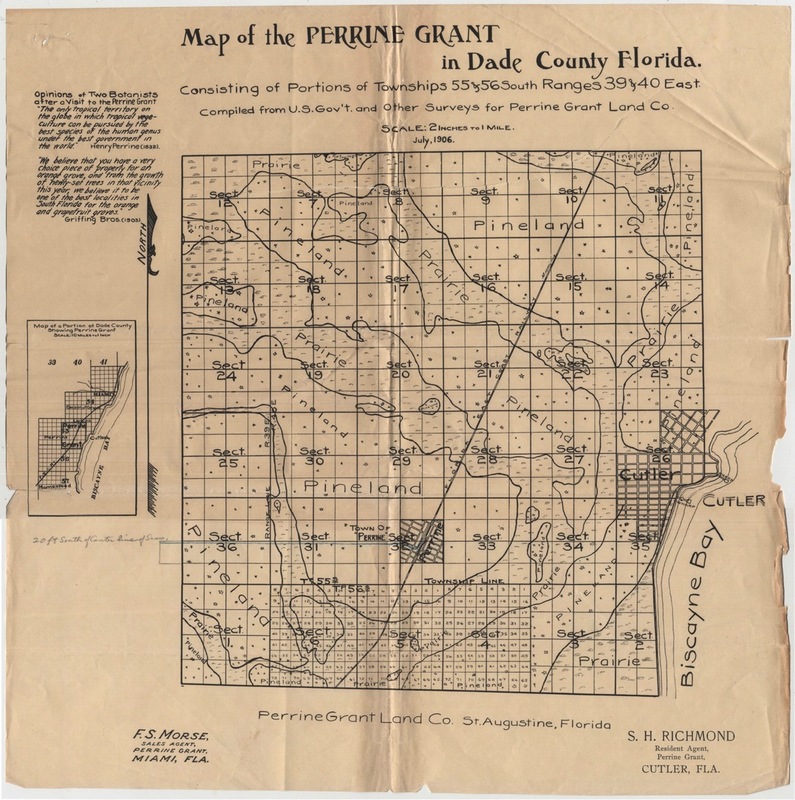 The territory south and west of the Perrine Grant in Dade County was opened for homesteading in 1897. John S. Frederick, the F.E.C. civil engineer in charge of determining the route to Homestead, had started his surveying work on July 2, 19027 and platted what became the Town of Homestead in June of 1904, ahead of the construction crews. Each of the squares on this map covers 40 acres. 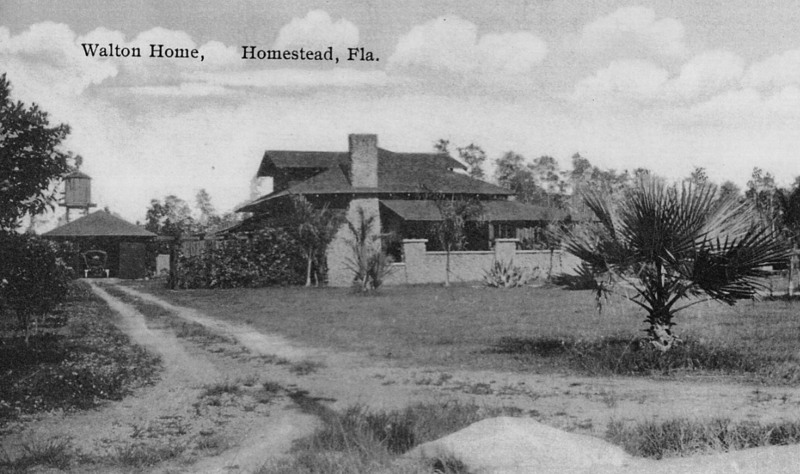 The solid vertical line to the right of the letter ‘d’ in “Homestead” is Krome Avenue. 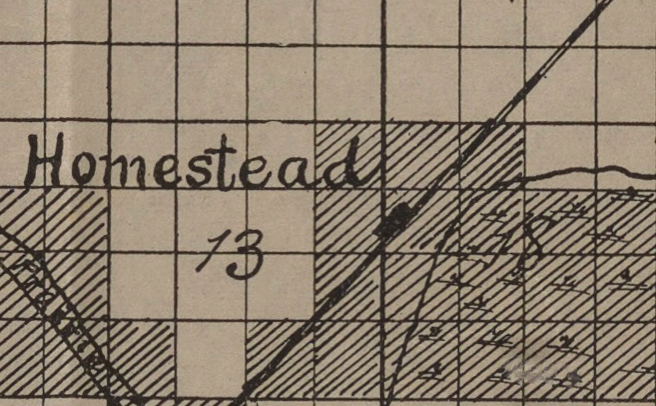 The solid black rectangle is what would become the Town of Homestead in 1913 and is shown in Frederick’s plat above. 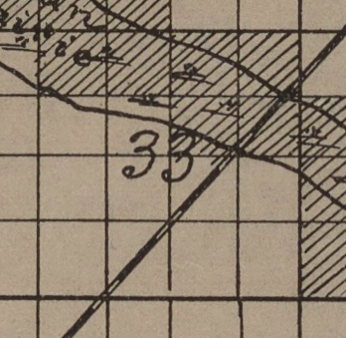 The diagonally lined squares indicate land that belonged to the Model Land Co. in December of 1903.8 The two squares to the left that would become the Town of Homestead are the east 1/2 of the northeast 1/4 of section 13, township 57 south, range 39 east, the legal description of that land. The square below the ‘d’ in “Homestead” runs from Campbell Drive down to Mowry. Each square contains 160 acres and was divided into 16 ten-acre parcels by the Model Land Company (MLC). 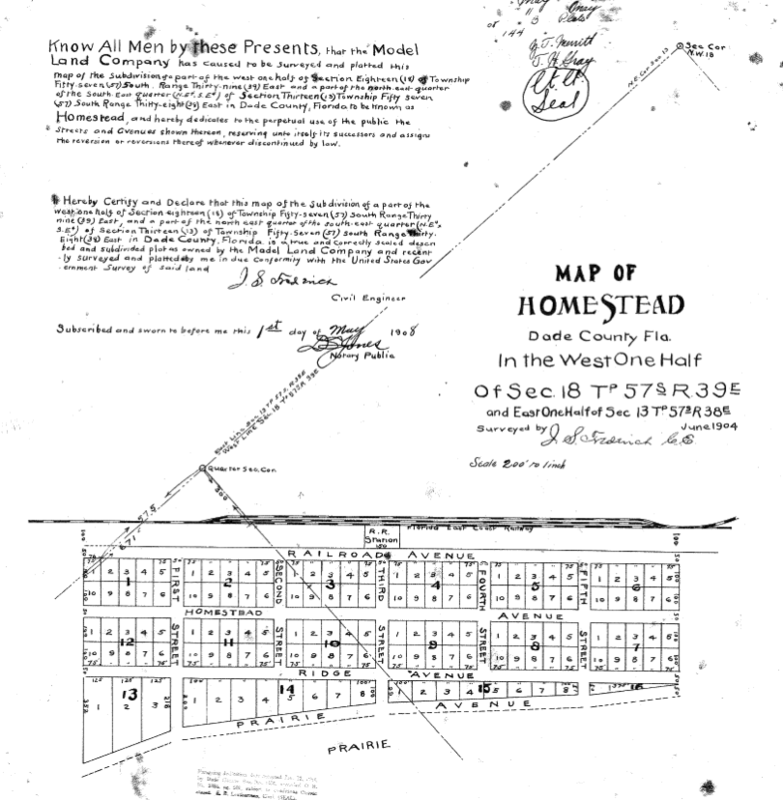 Despite what the map shows, the MLC only owned the east half – the west half was part of Leonard S. Mowry’s homestead claim, dated December 28, 1908. That east half runs from Mowry up to Campbell Drive and from Krome Avenue west to N.W. 2nd Ave. The square under the letter ‘d’, which runs from Campbell up to King’s Highway, was claimed as a homestead by Thomas A. Campbell on June 21, 1906. 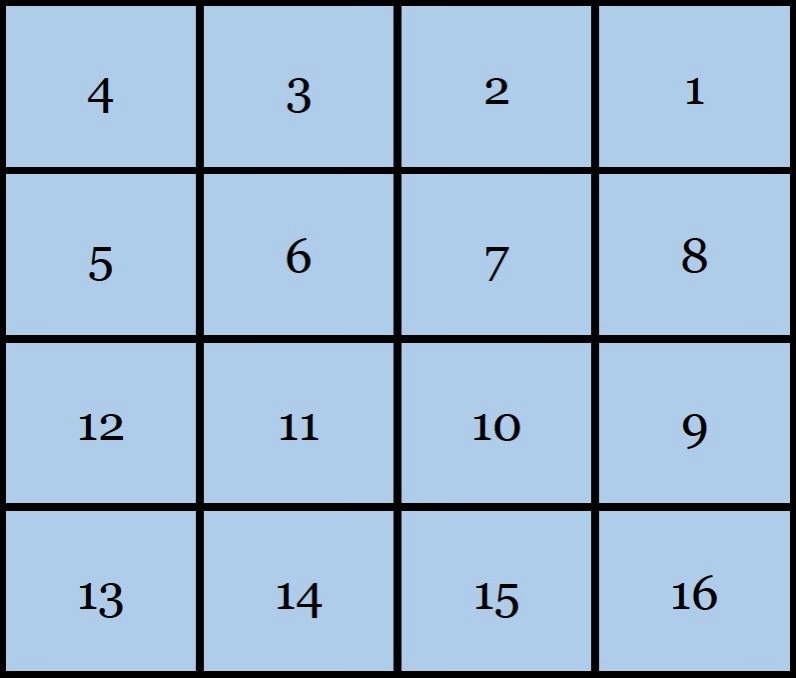 This drawing shows the lot numbers for each square. The MLC owned lots 1, 2, 7, 8, 9, 10, 15 and 16 and the remainder in both squares was part of Mowry’s homestead claim. Each lot was subdivided into two city blocks. Campbell Drive is at the top, Mowry is at the bottom and Krome Avenue is on the right side. 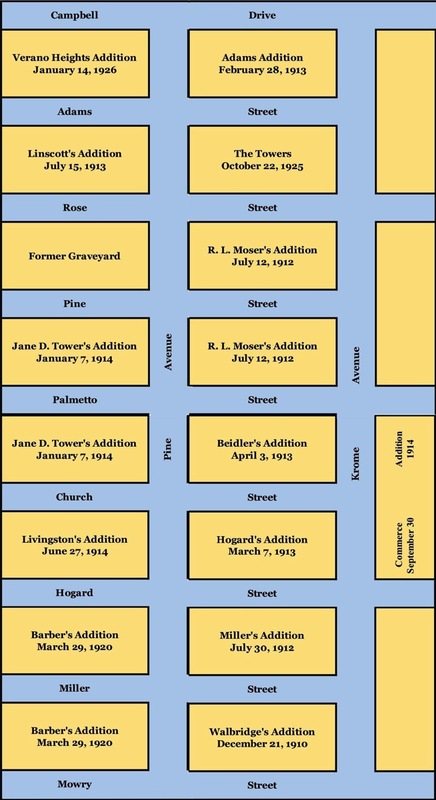 There never was an organized Homestead Cemetery with a Board of Directors, by-laws, and lots that were sold to individuals. 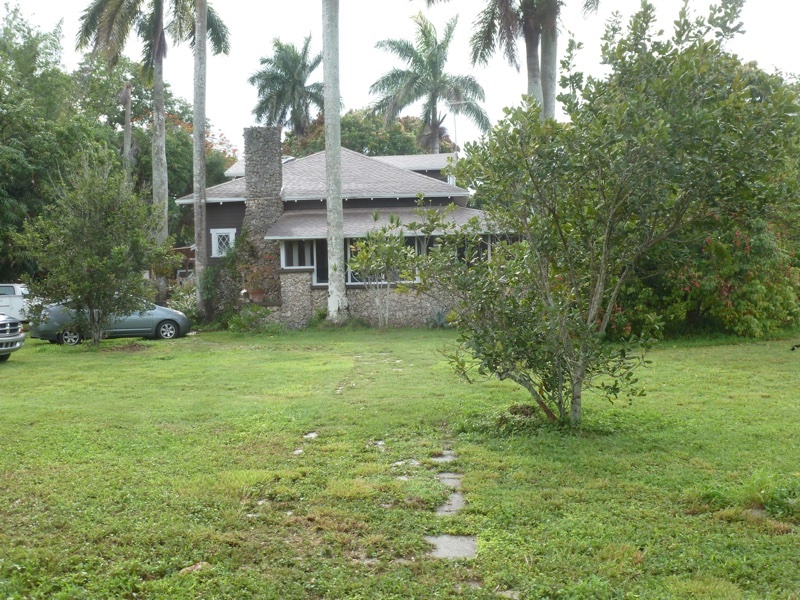 The number of bodies buried on the property reserved by the Model Land Co. for a graveyard in Homestead is unknown, but the figure was not large. Ed McMichael, whose grandfather was J. R. Dorsey, stated that as a child, he accompanied his mother to the Palms Cemetery to place flowers and tend to the family graves and was told that the bodies exhumed from Homestead were buried in a mass grave on the north side of the cemetery. They could also be buried in Section A – McFadden’s index shows 2 unknown adults and 7 unknown infants buried in that location. It is unlikely that any proof of those burials will ever surface, though. 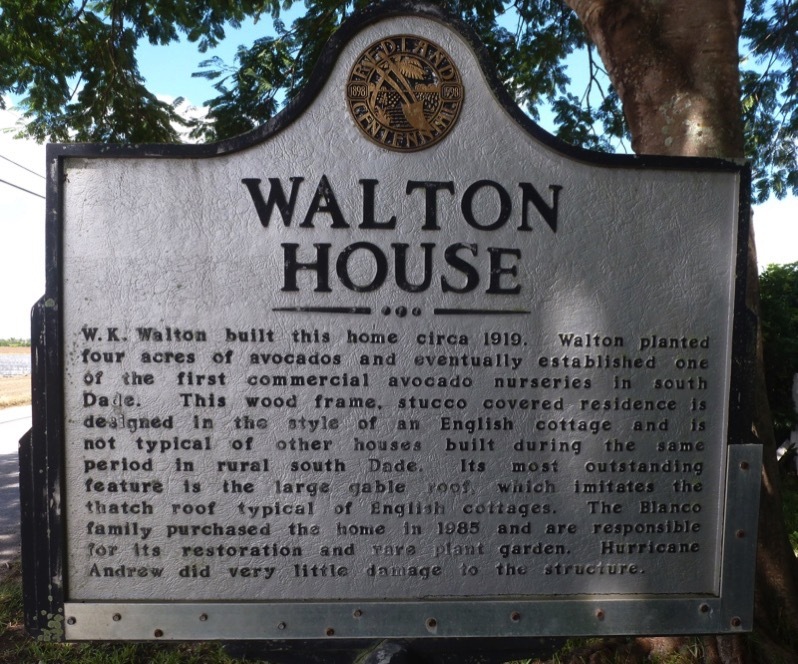 The folklore surrounding the existence of a Homestead Cemetery centers on Dr. John B. Tower and his “heroic” campaign to alert the citizenry to the dangers of drinking water contamination from leaking cadaver fluids. In part II of this article, I will explore that folklore and show why it is in error.